We believe it's important that companies have a simple but robust Travel Safety Management Plan. At the heart of the plan is an overseas travel policy statement, which outlines how travel risk is managed and signposts to any supporting procedures and documents. We work closely with clients to develop their own risk management planning and policy. Part of a travel policy statement is the need to conduct a travel risk assessment, especially if the intended destination is deemed to be of a higher risk. A risk assessment is designed to identify what risks might be present, scoring those risks and putting controls in place so that the identified risks can be managed. Travel Safety Management Plan - What's included? Writing a Travel Safety Policy Statement. Conducting risk assessments and/or designing forms, so that the evaluation process can be produced ‘in house’. Establishing a mechanism so that the risk assessment is a routine activity delivering the client’s duty of care to their staff. 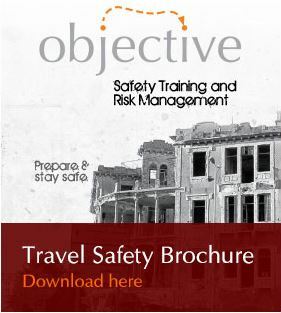 Training staff on how to conduct a risk assessment and manage corporate travel safety. Conducting reviews of current policies and procedures and revise your existing company documentation. In support of necessary risk assessments, we can design and produce pre-travel check lists and procedures; these check lists are also beneficial for those travelling to low risk countries. We provide tailor-made solutions to meet your specific company requirements. We have experience in providing bespoke solutions to our clients which include mid-cap businesses sending individuals or small teams overseas, to news-gathering organisations sending media workers to conflict zones. We have a flexible and adaptable approach to our business and fully understand the duty of care requirements.